The TS8 is the system platform for individual tasks. 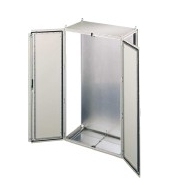 The enclosure system provides the perfect, cost-effective solution to individual requirements. Each enclosure is a specialist for particular tasks. the ultimate IT housing or the most appropriate electronic-packaging concept. High-performance power distribution components, perfectly tuned climate control units and robust outdoor solutions round off the unique all-embracing enclosure range from a global player in the business of innovation. future-oriented enclosure technologies with all relevant national and international approval certificates. Sophisticated design, perfection in ergonomics and handling, and the ability to offer Rittal partners solutions precisely tailored to their individual needs - those are Rittal's invincible strengths. Strengths which Rittal partners can rely and build upon at all times.